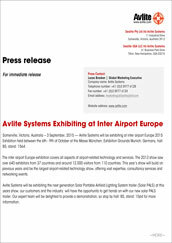 Somerville, Victoria, Australia – 3 September, 2015 — Avlite Systems will be exhibiting at inter airport Europe 2015 Exhibition held between the 6th – 9th of October at the Messe München, Exhibition Grounds Munich, Germany, hall: B5, stand: 1564. The inter airport Europe exhibition covers all aspects of airport-related technology and services. The 2013 show saw over 640 exhibitors from 37 countries and around 12,000 visitors from 110 countries. This year’s show will build on previous years and be the largest airport-related technology show, offering vast expertise, consultancy services and networking events. Avlite Systems will be exhibiting the next generation Solar Portable Airfield Lighting System trailer (Solar PALS) at this years show, our customers and the industry will have the opportunity to get hands on with our new solar PALS trailer. Our expert team will be delighted to provide a demonstration, so stop by hall: B5, stand: 1564 for more information. For more information about the 2015 inter airport show please visit the show website click here, the official show twitter handle is @interairport, the show hashtag is #IAE2015. To learn more about the solar Portable Airfield Lighting Systems trailer (Solar PALS) click here. To locate you’re nearest Avlite Systems sales representative, or to arrange a demonstration please click here.